Hello, and welcome to this six-part series on Thanksgiving hosting! Over the next couple of weeks, I'll be sharing how I work through the details of hosting in a sort of step-by-step overview, and I welcome your thoughts and questions. 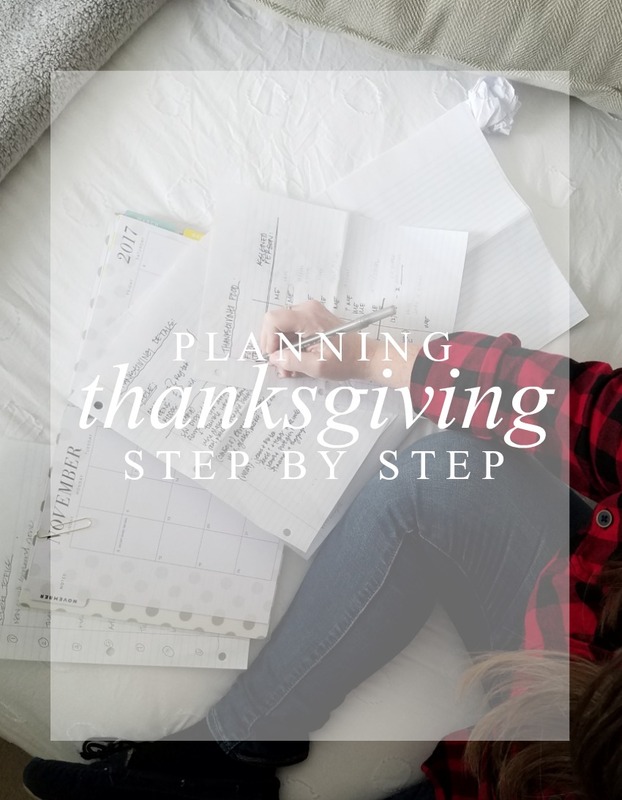 Today I'm sharing the planning stage of how I tend to host Thanksgiving. I don't believe hosting anything should be stressful, and with a half an hour of planning, it can feel and look almost effortless. I can still remember the very first Thanksgiving I ever hosted. Adrain and I were newlyweds living in the world's tiniest apartment. I hosted my parents and it felt a little like playing at being a grown-up. My mama had walked me through all the details during the previous year, and then stood at my side and coached while I made it my own holiday. She was fabulous and I get my love of hosting events from her. To this day, twenty two years later, she and I start putting our heads together months before the holidays. We love to plan the details, menu and figure things out so we don't have a lot of surprises and can simply enjoy the preparations and results. As I live in a relatively small, open space, planning ahead has always been a good idea when it comes to a large gathering. However, though I love planning details for a holiday event, my every day hosting style is more of a throw it all together in the moment and let it come together however it wants to. But... I always choose to be intentional when it comes to holiday details. Generally, I begin by gathering a sheaf of paper, pens, and calendar, and find myself a cozy space to work, uninterrupted. I make three separate lists, labelling each one at the top. I create; a shopping list, a menu & food delegation list, and a décor/table detail list. They really help me with organization on the front end. Beginning with the Menu & Food delegation list, I write down all of the traditional favorites and any new recipes I'd like to try. I usually host family and they are always happy to bring a few items which is nice. I can't tell you how important it is to delegate. If people don't offer, I always ask if they would be willing to contribute for many reason. Firstly, it helps ease the hosting (and budget) load some. Secondly, it helps them connect to the event and feel a part of it. Both are good. As I scan the completed menu list, I take a pencil and write my name next to every main item that I plan to make. Next, I jot names next to all of the remaining food items, until each person is bringing a couple of items. These are often things like rolls, cans of corn or cranberries and a pie. The goal is to get help, not overwhelm. Once I've sent a quick text to each person letting them know of their food assignment and making sure they are fine with it, I set it aside. (Do not throw this paper away. Chances are, someone will call you the day before, asking what they were supposed to bring.) I then break down my food items by recipe, listing ingredients that will need to be purchased, on the shopping list. I set that list aside, but I'll come back to it in a moment. 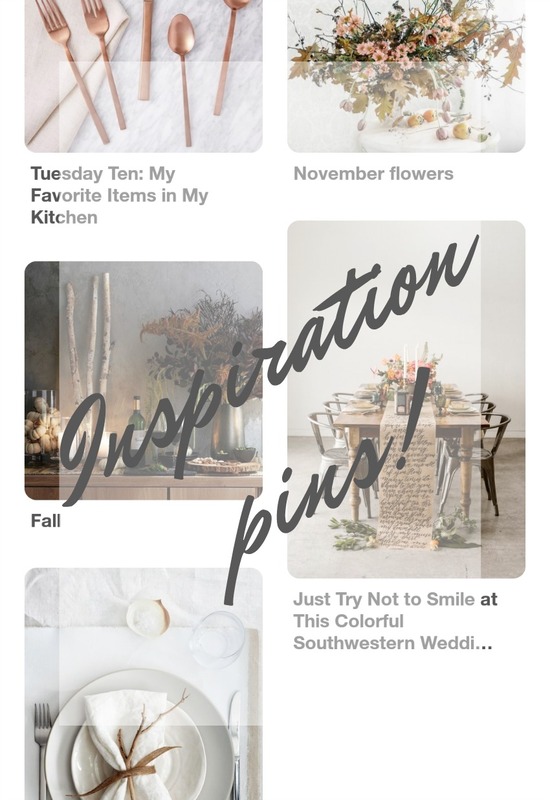 Finally I take out the décor list and begin thinking about how I'll set the table, the centerpiece, the guest number and how seating will accommodate and flow. I also think through beverage stations, dessert areas, kid entertainment and such. Sometimes I pull dishes and napkins out and arrange a few combinations on the table as I decide. Often, what really helps with this process, is Pinterest. This year, I saw a flower arrangement on Pinterest, that sparked some inspiration. From there, I decided on a drop cloth covering the table, neutral linens, white plates with natural and copper accents. I will be hosting a group of twelve this year, so as I evaluated seating, I decided on a kid's table. I can fit the nine adults and teens around our nine foot table, but the three kiddos are getting their own fun space. I jotted down items that I would need to put together, gather and purchase, and then I made notes on glassware, utensils and such, making decisions as I went. I grabbed my shopping list and updated as I went. Once done with all of that, the final remaining steps are easy. That's the daily timeline. Because at this point I know what I'm preparing, it's easy to decide what day to shop, thaw the turkey, bake a pie, arrange the flowers, etc. Within about a half hour, the entire thing is planned out and all that's left is to decide what to wear. I take my cue from the guests. If I'm hosting guests who don't mind wearing a cute dress, I'll often lean that way but if I know they won't be comfortable in anything but jeans and comfy clothing, I'll stay casual myself so they don't feel out of place in my home. Up next, I'll share how I plan to convert my buffet table into a beverage area and how I've set it up for easy hosting in the past. I'd love to hear your comments and feedback through this series and I'll do my best to answer any questions you might have as well. I already know I am going to love this series! Thank you for sharing your gifts with us!